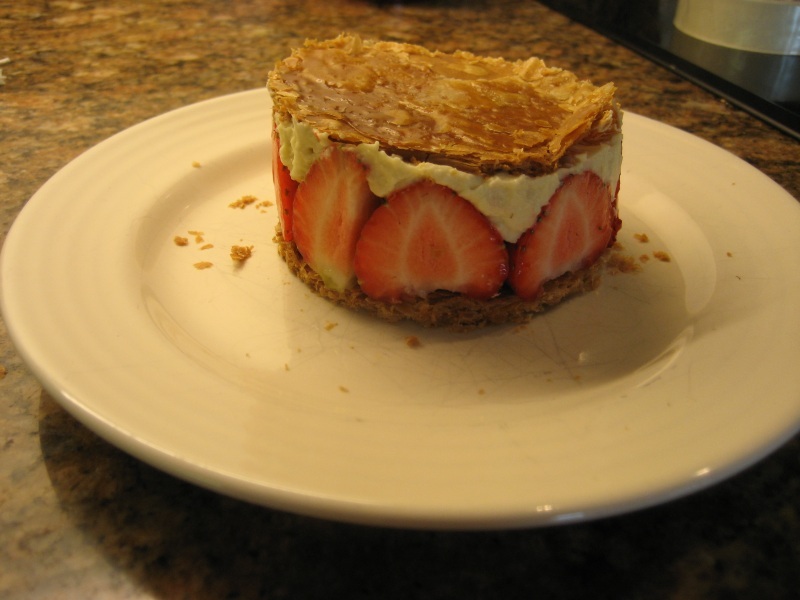 My latest evening course on dinner party cooking has been a great opportunity to focus on desserts, something I normally avoid eating, let alone preparing. This dish is my own recipe, with elements inspired from all over the place. 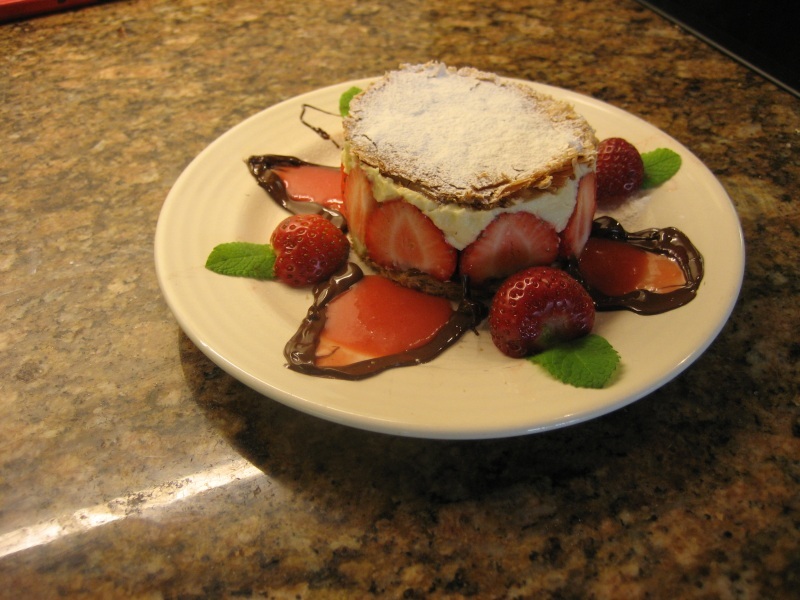 The idea was a simple homage to the classic Mille Feuille (thousand leaves) that didn’t requires years of pastry training and tastes great with freshly picked strawberries. Sorry for the lack of quantities of the ingredients, I do almost all of my creating by feel. This can be made hours before serving and keeps well in the fridge, but only if you don’t tell anybody it’s in there. The first element to sort out is the Pastry. The idea is to have the lightness of puff pastry but with none of its expanding height. 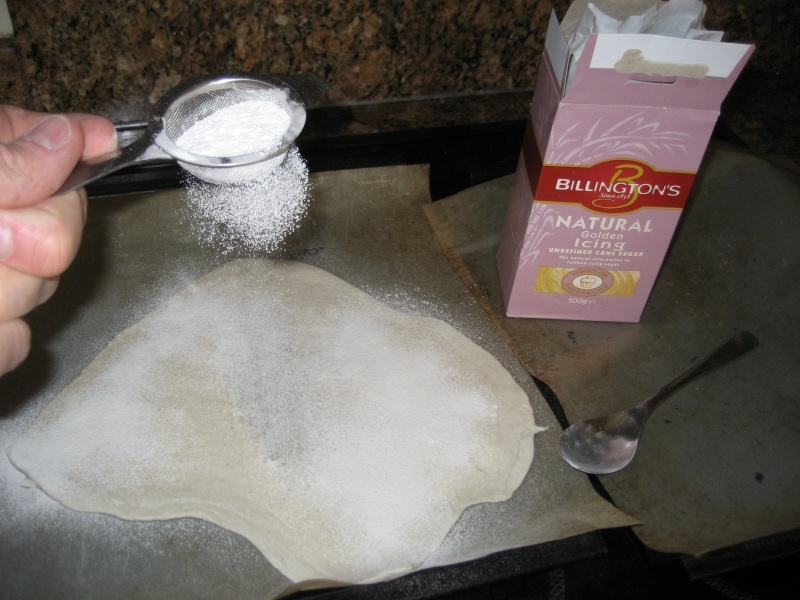 Roll out the puff pastry so it’s fairly thin, then place it on a sheet of something non stick on a baking tray. Use a tea strainer or small sieve to lightly sprinkle about a teaspoon of icing sugar onto the pastry, then cover it with another non stick sheet and press it down with the second baking tray. Put it in the oven for half of the cooking time indicated on the packet’s instructions. Whilst that’s baking, you can get on with making the fruit coolis. 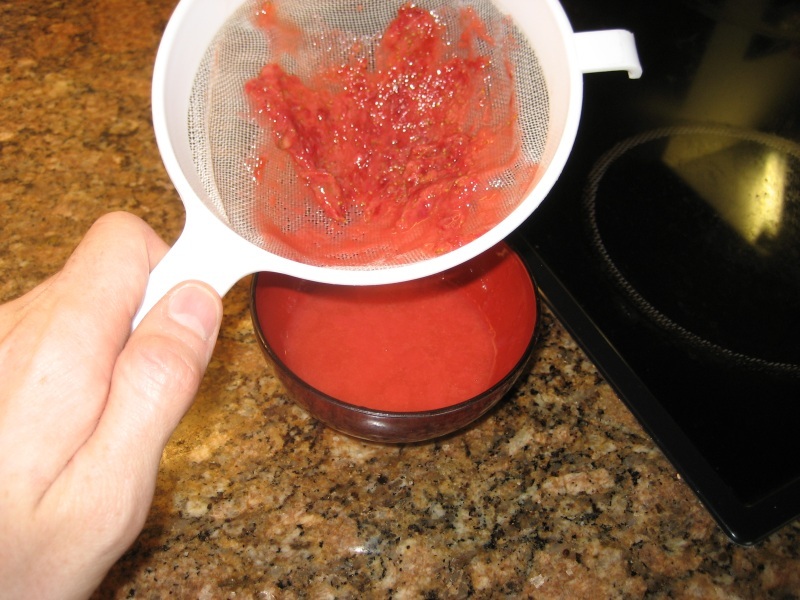 For soft fruit, this turns out to be easier than you’d think. 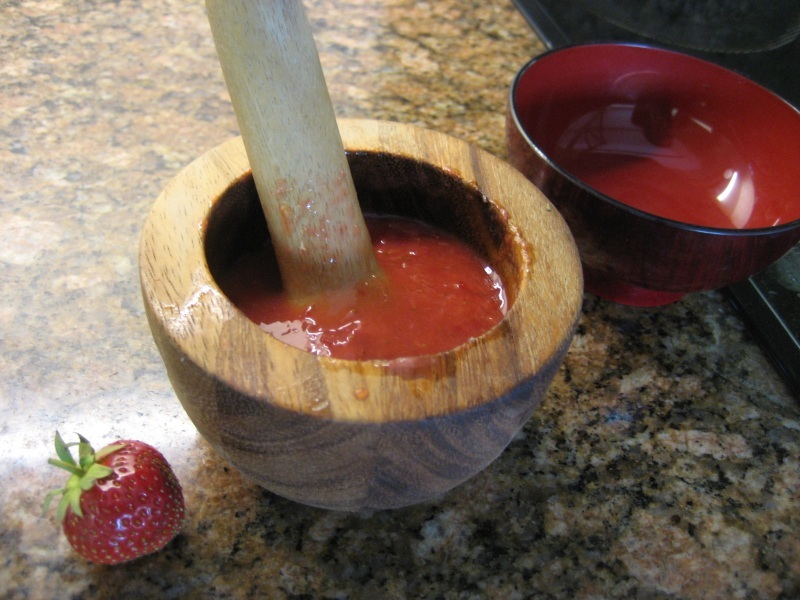 I took 4 strawberries and bashed hell out of them using my wood mortar and pestle, then passed them through my tea strainer with the help of the back of a spoon. 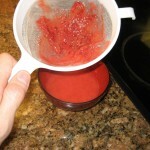 Clean your sieve then use it to gently stir in a teaspoon of icing sugar to the fruit. By now, the oven timer’s probably beeping, so take out the half cooked pastry and sieve over another teaspoon of icing sugar. Put the pastry back between its sheets of parchment and baking trays and give it the remaining 10 minutes in the oven. Whilst that’s cooking, you can get on with the next element, the vanilla cream. Simply add a couple of drops of vanilla extract or paste to some double cream and give it the beans with an electric whisk until the cream can just hold its shape. You don’t want it to be so solid that you can stand a spoon in it, or you’ll never pipe it out. Now prepare your fruit. 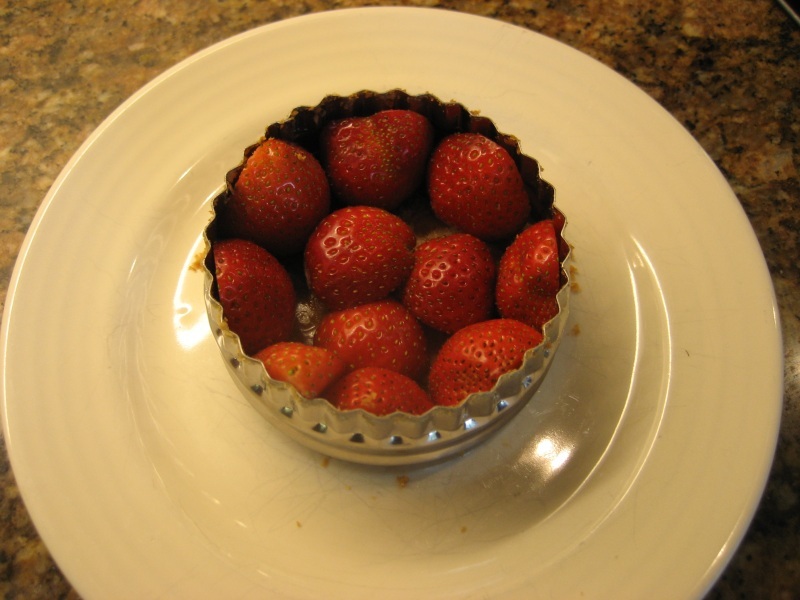 The quantity will depend on the size of your fruit and moulds (i used a medium pastry cutter for my mould). I took about a dozen strawberries and cleaned, hulled and sliced them in half lengthwise. 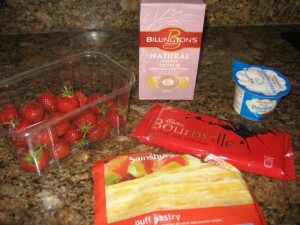 Take out the pastry and let it cool to room temperature. Once that’s done you can cut out 4 pieces of pastry for the tops and bottom of the dish. Make sure the sugar crusted side is upwards. Now for the fun part, assembling it without making a splodgy mess. Leave the first pastry circle in the bottom of the mould and place it in the centre of a flat plate. Now stand up fruit around the outside edge, I think strawberries look better with the cut side outwards. You may need to cut one down so that the circle doesnt overlap. Put a couple more slices in the bottom. Now, using a piping bag or a pair of teaspoons, fill up the mould with the vanilla cream and top it with another piece of pastry. If you’ve got more than one mould, then great, leave it on until the last minute so the cream can get hold of the fruit and pastry so it holds together. Next, melt a few squares of Bournville choc in the microwave or bain marie and pipe very very small decorative lines on the plate. 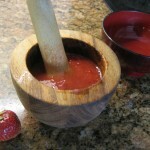 The idea here is to make an edge you can fill with coulis, so don’t leave any gaps. Ignore the thickness of my choc in the photos, I’m rubbish at piping melted choc. Give it a few seconds to set, then carefully spoon some in some coolis. The fruit coolis should settle into any gaps after a few seconds, so don’t be tempted to overfill it, it doesn’t take much to spill over. You can now put the desert in the fridge until it’s needed. The pastry’s sugar crust should help stop it going soggy for a few hours. 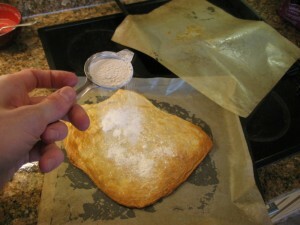 Just before serving, sieve another half teaspoon of icing sugar onto the top of the pastry. Then, holding down the top pastry lid, gently gently lift off the moulds. Garnish with a few mint leaves under some more fruit and serve. 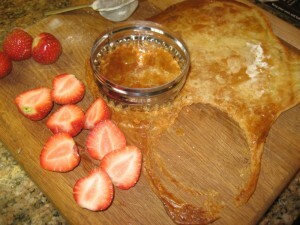 This entry was posted in Food on July 10, 2011 by Dav Stott.